An excellent exhibition under the 81st TIF for the legends and myths of Thessaloniki. A report that received great feedback from thousands of visitors! Thessaloniki, a city with a 2,300 years of history, does not stop surprising us with separate stories that emerge from every neighborhood. This city, full of myths, traditions and hidden narratives, revealed some of its secrets to the visitors of the 81st TIF. Back in the past, in Thessaloniki the consensus and the approval of the mother-in-law for a wedding took place in the hammam, baths of the city, after the bride had been seen and approved naked by the future mother-in-law. The fountain of Navarino Square represents a hero of the Second World War. Where did the fire that destroyed the city in 1917, begin from and what swept the whole city? Where were the holy children captured with the blessings of the goddess Aphrodite in Thessaloniki? Where and why has the name “the city of coffee” and the “take things easy” of Greece come from? 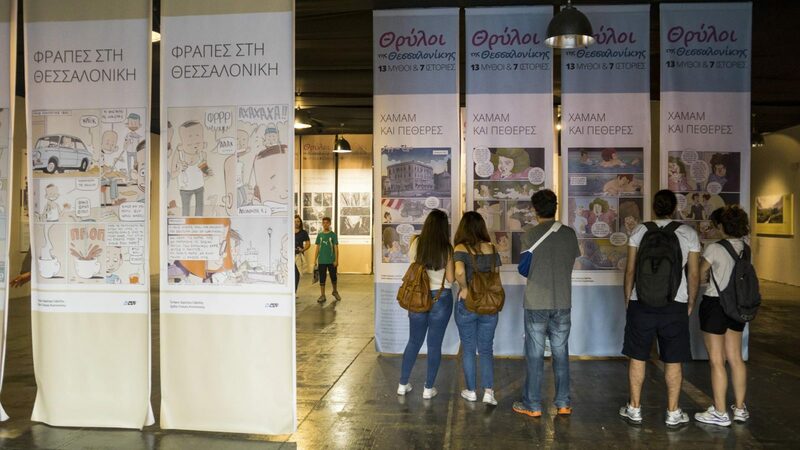 As a means of telling these stories, there were comic stories and illustrations of artists from all over Greece.